Reliability-based design is relatively well established in structural design. Its use is less mature in geotechnical design, but there is a steady progression towards reliability-based design as seen in the inclusion of a new Annex D on "Reliability of Geotechnical Structures" in the third edition of ISO 2394. Reliability-based design can be viewed as a simplified form of risk-based design where different consequences of failure are implicitly covered by the adoption of different target reliability indices. Explicit risk management methodologies are required for large geotechnical systems where soil and loading conditions are too varied to be conveniently slotted into a few reliability classes (typically three) and an associated simple discrete tier of target reliability indices. Risk and Reliability in Geotechnical Engineering makes these reliability and risk methodologies more accessible to practitioners and researchers by presenting soil statistics which are necessary inputs, by explaining how calculations can be carried out using simple tools, and by presenting illustrative or actual examples showcasing the benefits and limitations of these methodologies. Risk and Reliability in Geotechnical Engineering presents all the "need-to-know" information for a non-specialist to calculate and interpret the reliability index and risk of geotechnical structures in a realistic and robust way. It suits engineers, researchers, and students who are interested in the practical outcomes of reliability and risk analyses without going into the intricacies of the underlying mathematical theories. Kok-Kwang Phoon is a distinguished professor and head of the Department of Civil and Environmental Engineering, National University of Singapore, and past president of the Geotechnical Society of Singapore. His main research interests include statistical characterization of geotechnical parameters and reliability-based design in geotechnical engineering. He is the recipient of numerous research awards, including the ASCE Norman Medal in 2005 and the NUS Outstanding Researcher Award in 2010. He is the founding editor of Georisk and chair of TC304 (Engineering Practice of Risk Assessment and Management) in the International Society for Soil Mechanics and Geotechnical Engineering. Jianye Ching is a professor in the Department of Civil Engineering, National Taiwan University. His main research interests include geotechnical reliability analysis and reliability-based design, basic uncertainties in soil properties, random fields and spatial variability, and geotechnical design codes. He is the secretary of TC304 (risk) in the International Society for Soil Mechanics and Geotechnical Engineering. He is the recipient of the Outstanding Research Award and the Wu-Da-Yu Memorial Award from the National Science Council of Taiwan, Republic of China. 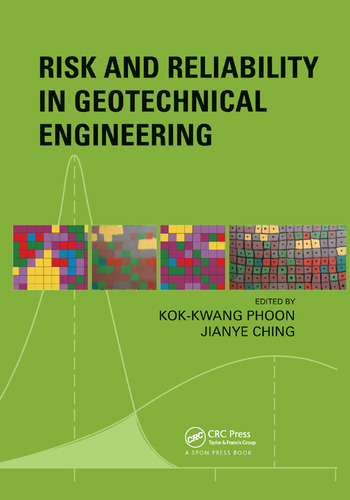 "Risk and Reliability in Geotechnical Engineering ...was, originally, to be an update of the 2008 book Reliability-based Design in Geotechnical Engineering – Computations and Applications (edited by K. K. Phoon). The update turns out to be a completely new book, and is a ‘must-read’, not only for those interested in risk and reliability in geotechnical engineering, but also for the geotechnical practitioner." "This is a welcome continuation of the very successful volume, Reliability-Based Design in Geotechnical Engineering… Practitioners will find very useful information that range from simple to advanced methods, and from site characterization to design and decision. The book will certainly encourage the use of reliability in practice." "This is an excellent book, written by acknowledged experts in the field for practicing engineers interested in geotechnical reliability analysis. The presentation is very clear and the subject matter delivered at just the right level – not too mathematical, yet still rigorous in approach. Practical matters, such as designing site investigations and selecting parameters for design, are covered well. Highly recommended." —Dr. Andrew Bond, Geocentrix Ltd.
"The main strength of the materials I have reviewed is that they address the needs and questions of users of many different backgrounds, from practicing engineers who are curious about the added value of doing risk and reliability analyses, but are intimidated by the terminology and mathematics, to professional risk analysts who are more concerned about safety philosophy and application of more advanced analysis methods in assessing the value of information."